Deep joy hit me the other day with the arrival of a Wacom Intuos4 L graphics tablet. No, I haven’t lost it and turned MuzoBlog into a discourse on digital imaging. 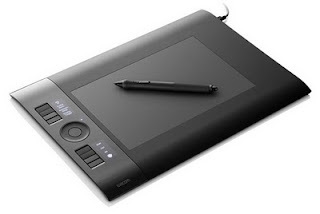 A graphics tablet is of similar function to a mouse and no matter how many keyboard commands you learn, you’ll still need frequent recourse to some kind of pointing device when coaxing music from a computer. Since the 1980s, I’ve used a multitude of mice, often for protracted periods; often with great intensity. Sadly, my many mousing years have contributed to a condition called right-side ulna neuropathy, ie there’s damage to my right hand, possibly attributable to the flavour of RSI that adolescent joypad jockeys will experience in later life. Also, kinaesthetically calamitous for some, playing a musical instrument hour after hour can really screw with one’s bits. Guitarists in particular are vulnerable to hand, elbow and neck trauma through repetitious stressing of muscle, tendon and ligament. Of late, my right hand is less co-ordinated overall and I can no longer fully extend my fourth and fifth digits, so that’s flamenco foiled and my picking in a pickle. It also means that on bad days, grasping a mouse to mess with a sequencer provokes pain. Luckily, I’m quasi ambidextrous in that I mouse, play guitar, etcetera right-handedly, but hold a pen, brush or stylus with my left. If I’m to retain what remains of right-hand function, yet still make music, the strain on my right needs relief. There’s also the cool notion of being able to draw music on screen with a stylus rather than a lump of mousey plastic. Such are the reasons why I wanted a Wacom. The Intuos4 is available in a variety of sizes, from Small with an active area of 15.75 x 9.84cm, to Extra Large (XL) at 46.2 x 30.5cm. I needed something wieldy enough to park on my lap as I sit at the MIDI controller keys, yet large enough to accommodate a dual-screen set-up. The Intuos4 L, with an active area of 32.5 x 20.3cm and footprint of 47.4 x 32cm, seemed the ideal compromise, and so this sturdy, well-designed peripheral has proved. It’s supplied with a rubberised, two-button Grip Pen and a pen stand incorporating a holder for replacement nibs. An installation CD hosts drivers for OS X 10.4.8+ and Microsoft Windows XP, Vista and 7, while connection is via USB. Wacom has made this an ambidextrous affair, with USB sockets at left and right, plus an LED read-out alongside the eight ExpressKeys that flips 180 degrees depending on how you configure things when installing. Dividing the ExpressKeys is a Touch Ring with a programmable central button offering access to four assignable functions, such as zoom, scroll or whatever you define in preferences. Zoom is obviously useful when working with a sequencer and being able to assign the ring to a sequencer’s or sample editor’s Scrub function is handy indeed. An ExpressKey toggles between dual-screen mode and either of the single screens, so if you’ve the sequencer on one monitor and plug-ins on the other, it’s a cinch to hop between them. With drivers loaded, the Intuos configured itself to use the whole viewing area. Place the pen at the top right of the active area and there’s the cursor at top right on the right-hand monitor. Positioning bottom left mirrors the story and I was up and running in moments, without having to adjust config to accommodate two different sized monitors and without even having to restart. 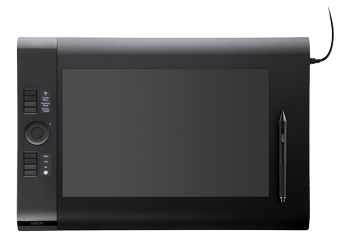 The Intuos4's 2,048 levels of pressure sensitivity could well be irrelevant to my needs, unless they can be assigned to, say, velocity, or even a continuous controller such as volume, modulation or aftertouch. I haven’t tried assigning pressure levels as yet, but will blog the results if I get any. The Grip Pen itself rests vertically or horizontally in the holder a good and grippy grasp away, although it took a bit of practice to get my head around jotting left-handedly with a stylus when I’m accustomed to right-handedly waggling a mouse. Further, the pen’s programmable rocker switch is tricky to actuate at first, but time and practice will tell. A single tap on the active area is a left-click and rapidly tapping twice is, of course, a double-click. I found clicking and dragging easy to master, although the relatively huge range of arm movement required to navigate the desktops threw me at first. But with Grip Pen in one hand and the other hovering over the ExpressKeys and Touch Ring , or the mouse which is still plugged in, it rapidly became obvious that there’s huge potential here for productivity. Click and drag to create MIDI events, draw accurate data in the controller lanes, chop that sample, tweak that timbre, all as intuitively, nay Intuosly, as doodling on paper. Even the non-ambidextrous will find the Intuos4 advantageous.